Jon certainly understood my quandary about purchasing these albums, but I tried my best to put a more positive spin on this situation, even if it ignores the blunt truth that these bands are defunct, profoundly unknown, and/or unlikely to sell for full used price. First, in the case of the Juno CD, which I already own, I’m likely to pass it along to a friend who’s never heard of the group outside of my involvement in the documentary. If they enjoy it, they might buy A Future Lived in Past Tense or the split EP with the Dismemberment Plan. I’ve done this before with similar “I need to save this great album from the injustice of the dollar bin” finds and a few of their recipients have seen the band live or purchased another album. Second, if someone else is looking for any of these albums, they’re more likely to pay full price for them. Suckers. Third, if I enjoy one of these albums, I’m more likely to buy a full-price disc from one of these bands in the future, which might not have happened if not for this situation. I didn’t go into Reckless hoping to find Brief Candles or Midsummer albums, but their newfound place in my collection makes it more likely that I’ll check them out in the future. Finally, I do my best to buy releases from bands I enjoy at their shows, from their labels, or new from independent record stores. These points are all trumped by the blunt truth stated above, but that’s the harsh toke about much of the music I enjoy: most people don’t care as much as I do about it. In a perverse way, I appreciate that fact, since it allows me to make connections with people like Stephen Howard, Basla Andolsun, and the members of Juno, but it still pains me to be presented with the economic reality of their situation. This internal debate between the morality of my music fandom and the quantity-loving impulse of my record collector urges will likely continue throughout The Haul. I remember being taken aback by the shock of Parasol Records’ promotions guy Michael Roux when I revealed that I downloaded music and purchased used CDs, since both methods circumvent artist compensation, but I’ve done my best to reconcile my positions since that conversation. Even this predominantly used purchase has one notable new release on it. My friend Scott had mailed me Thee Speaking Canaries’ Songs for the Terrestrially Challenged and Life-Like Homes back in September and I enjoyed the latter so much it was discussed in two unfinished posts for this site. (Yes, I have some catching-up to do.) At the time I couldn’t remember which Speaking Canaries LP I’d previously seen up at RRRecords in Lowell, so Scott asked if it was the original lo-fi pressing of Songs for the Terrestrially Challenged. “Lo-fi pressing? I’m intrigued!” I replied, but by the time I returned to RRRecords, they’d sold whichever Speaking Canaries album I’d seen. I’d since seen this version of the album on eBay once or twice, but didn’t pull the trigger. When I found it in the Reckless online catalog, I put it in the must-buy pile. I can’t pass on a limited edition alternate version of a Speaking Canaries album with a hand-made sleeve (Damon Che’s hand-written liner notes, random photos glued to the gatefold), even if I greatly prefer Life-Like Homes. I still need to pick up their most recent album, Get Out Alive, which, true to form, has both a long-form CD version and a pared-down LP version. If only Damon Che would devote more time to this project and spend less time making “Don Caballero” records without Ian Williams. I had originally hoped to buy this album from the band when they performed over by Berklee in the summer, but the vinyl wasn’t finished by then and I ended up missing the show. I put off buying it at Amoeba Records in Los Angeles, thinking I’d buy it from Parasol when I placed an order with them later in the winter (still hasn’t happened), but when I picked it up at the Broadway Reckless and realized how nice the packaging was, how much care the group and Kora put into this release, I figured that I should put it high on my list for my trip to the Milwaukee location. It’s one of most expensive new albums that I’ve purchased (not that it’s overpriced*), rivaled by Pelican’s gatefold 2LP for The Fire in Our Throats Will Beckon the Thaw, but I’ve never regretted picking up that Pelican album and I doubt I’ll regret buying Rest. I did question my LPs-whenever-possible policy for a moment, given that the CD has equally nice packaging and costs half as much, but the vinyl sounds superb. This album nearly topped my best-of-2008 list, so definitely buy one of the pressings. *With regard to the seemingly high cost of this album, I learned a valuable lesson about micro-pressings of LPs when talking with Stephen Howard of Pinebender about their 2LP pressing of Things Are About to Get Weird (200 copies; get yours soon). Even without the custom artwork of this Gregor Samsa record, Pinebender was barely breaking even by charging $20 for their album. Granted, Gregor Samsa pressed 500 copies of Rest, so the vinyl itself likely cost slightly less, but the packaging certainly cost more. Given how often I pine for lesser-known bands to press their albums on vinyl, I feel compelled to support them when they go through with it, even if it’s pricier than the CD. Juno waited five years into their existence to record and release a full-length album. They did three U.S. tours on seven-inch singles. They weighed their options on labels, turning away quite a few major label scouts interested in mining any Seattle-area talent. They dropped early songs that didn’t meet their standards. They changed from their name indie producer (Steve Fisk) to the in-house engineer at the studio (Kip Beelman) midway through recording because the former was rarely in the studio and pressed the group to release an EP and the latter understood the intended scope of the record and had already done the bulk of the recording. Too many bands rush into recording their debut album. This Is the Way It Goes and Goes and Goes is a prime example why bands should wait, road-test material, record singles, weigh their options, take time in the studio. The rush of instant gratification from a hastily recorded tour CD-R might sell some $5 CDs at your local gigs and help you buy a slightly better van, but will people still love your debut album a decade later? Or will it be something you sweep under the rug? Take your damn time. I was going to completely wing it on Del Cielo by mentioning how nice it was to see Beauty Pill and how I hope that Chad Clark’s doing better after his heart surgery and then going into how I wish Bald Rapunzel had recorded a second album (they shared drummer Katy Otto with Del Cielo), but I felt compelled to put the CD in my computer’s drive and actually listen to it. Not sure what I expected from Us Vs. Them, but the first few songs have been of the dynamic rockers with a bit of pop-punk creeping in on the edges and diary-styled lyrics. Andrea Lisi goes overboard on vocals a bit and doesn’t have the range of Bald Rapunzel’s singer Bonnie Schlegel, but there’s no lack of melody or energy. Faint praise perhaps, but I just felt like hearing Bald Rapunzel’s “Sun Drop” again, which is one of the better forgotten D.C. rockers. Side note: When googling Beauty Pill to find their web site, I came across this horrible, horrible review of The Unsustainable Lifestyle at Coke Machine Glow. It's hard to imagine a reviewer missing the joke that much, but I doubt they heard Smart Went Crazy or have the slightest idea on how Chad Clark's bands do or do not fit into the D.C. scene. I recall receiving Catch and Blur, the first Midsummer EP for review when I was doing Signal Drench and genuinely enjoying their brand of lush indie rock/shoegaze, so it didn’t shock me when Shawn Schultz signed them to Sun.Sea.Sky. for a release. I fell out of touch with Shawn after Signal Drench closed up shop, which partially explains why I never heard this split release with Coastal, but I’m interested in seeing how Midsummer progressed. I may have to track down their first full-length, Inside the Trees, which was released last year. I’ve largely avoided returning to a few of the groups I enjoyed reviewing in the early Signal Drench days, in part because I’d usually learn of whichever bands they were ripping off a few years later and think “Oh, that’s where they got it from.” Since the majority of the promos I received were mediocre indie rock or mediocre emo, I was probably too easily impressed, but every now and then I’d find a band like Durian (Jawbox/Shudder to Think-influenced D.C. group) or Tungsten74 that I was willing to stand behind. In the case of Tungsten74, they kept getting better and better. Jon Mount has been pushing Des Ark for quite some time, but this split CD is the only release I’ve tracked down, since I haven’t found the LP pressing of Loose Lips Sink Ships. He played this split album for me the last time I was in St. Louis, scoffing at some of Ben Davis’s contributions but heralding Des Ark’s side and involvement in the two collaborative tracks. Des Ark has the whole sassy titling thing going, which is a plus (“If by ‘Gay’ You Mean ‘Totally Freaking Awesome,’ then Yeah, I Guess It’s Pretty Gay” for one), but any reason for me to remember the sheer horror of Elton John’s “Bennie and the Jets” should be publically denounced. By necessity (no drummer), these songs swing more toward the folk side of Des Ark, losing the Faraquet-esque bite of the aforementioned Loose Lips Sink Ships (a solid record despite some overbearing lyrics) and sounding a bit more like Cat Power in the process. Not recent Cat Power, but What Would the Community Think/Moon Pix era. You know, the good stuff. Brief Candles were based out of Peoria (they’ve since moved to Milwaukee, Wisconsin) and played at least one show with personal favorites Rectangle, but I didn’t catch them during my years in Champaign. That’s a shame, since judging from the first few songs on They Live We Sleep, I would have enjoyed their blend of male/female vocals, energetic rhythms, shoegaze-inspired guitars, and occasional bursts of Sonic Youth noise. That description sounds an awful lot like what I wrote about Film School below, but Brief Candles sound far less serious than Film School, whose gravity veers close to Interpol territory. That is meant to be a compliment for Brief Candles, since they manage to keep things light despite some epic guitar crests. I’ll definitely catch them if they tour the east coast. Ambulette is (was?) the post-Denali project for Maura Davis, originally named Bella Lea, featuring former Pinebender guitarist Matt Clark, current Pinebender guitarist Stephen Howard, and prolific drummer Ryan Rapsys (Euphone, Heroic Doses, and Sweater Weather, who shared a Polyvinyl seven-inch with Days in December [Jeff Garber and a few members of Very Secetrary]). Stephen Howard was in Denali when I saw them, so it didn’t shock me that he was recruited to Davis’s new group. I’d heard this EP when it was released and wasn’t hugely impressed—Davis has always struck me as someone with more raw talent than songwriting chops, with a few exceptions on Denali’s The Instinct—but I figured I’d give it another shot. I’m unsure if Ambulette is even a band anymore, since Davis moved onto Glös, which featured her brother and Engine Down/Cursive drummer Cornbread Compton before briefly reuniting Denali last year. I’d be interested in hearing new music from her, but I’m certainly not waiting with baited breath. A brief anecdote from that Pinebender/Denali show, which was the only concert I caught at the now-closed Nargile Lounge / hookah bar in Champaign: I remember getting to the show early and hanging out with the Pinebender guys, since I’d met them at their show at the Prairie House in Bloomington, and being introduced to the Denali crew. Davis quickly noticed that a Denali super-fan (“stalkerazzi”) had come to yet another show and quickly shuffled downstairs to avoid him. During their set it was impossible not to stare at this guy, since he was pounding his fist in the air with every syllable and belting out the lyrics. Since this show, I’ve been completely terrified of being that guy, but given that I have video documentation of the Juno reunion shows and do not exhibit stalkerazzi tendencies, I think I’m safe. I have a small handful of literary LPs—Robert Frost reading poetry, Dylan Thomas reading poetry, Joseph Heller reading parts of Catch-22—all of which were released on Caedmon and purchased at similar prices from cheap bins. I’d gladly pick up quite a few of these albums at the right price—Camus, Pound, Faulkner, Cummings, Eliot, Auden—even though I still haven’t dropped the needle on any of the ones I already own. I learned during undergraduate that some poets are far, far better at reading their works than others and I’m not one to attend local poetry readings, but there’s a definite appeal to hearing the author recite his own work, especially when all of the authors mentioned have passed away. Caedmon is now part of HarperCollins Audio Books, but there’s a difference between hearing a sampling of work as you’ll find on an LP or hearing the entire book. I’ve never listened to an audio book in my life and, fingers crossed, never will. I’ve passed on complete performances of Shakespeare plays for that reason. I made an exception on for this play, since it was fifty cents and I’ve put off reading any O’Casey for quite a while. I’m unsure of the official publishing date for this performance of Sean O’Casey’s play Juno and the Paycock, but the performance itself occurred in Dublin during June, 1955. It was definitely published after O’Casey’s death in 1964, since the liner notes mention it, but they fail to mention the date of release. Certainly a future candidate for Record Collection Reconciliation. I must have seen the back of this single as I was hastily flipping through the cheap singles, since there’s no artist info on the front and Brainwashed in huge letters on the back. This acts as a positive barometer of its quality, since The Brain is usually on point in its record reviews, and gives away some vague idea of the aesthetics (Thrill Jockey/Kranky, avant-garde, possible post-[genre]). As it turns out, Bailiff now records for Kranky in a droning, somewhat post-rock-informed style of slowcore. I’m awfully proud of myself on this one, although if I’d noticed that she’d covered Flying Saucer Attack at the store I could have more accurately made those assumptions. Bradley’s Almanac mentions Film School on a semi-regular basis, but I’ve yet to see one of their shows or pick up one of their albums. (Sorry Brad.) I had downloaded Hideout, their 2007 album featuring “Dear Me,” but it’s one of those albums that I grabbed and skimmed a bit, enjoying said single but not making too deep into the album. Hideout apparently features a guest appearance from Colm Ó Cíosóig of My Bloody Valentine, which makes sense given the group’s mix of shoegazer tendencies and indie rock propulsion. This promotional single includes a non-album b-side and a sticker, the latter of which is headed for my big bag of stickers unlikely to ever be stuck to anything. After seeing Ace Fu on the label, I checked out who was in All Scars in the liner notes, since I’d never heard of the group before. Guitarist James Canty comes with quite a bit of name recognition from his tenure in Nation of Ulysses, The Make-Up, Ted Leo and the Pharmacists, and French Toast and his relation to Fugazi drummer Brendan Canty (who drums for All Scars on a different release) and novelist Kevin Canty (one of Jon Mount’s favorites; I have Into the Great Wide Open sitting in the to-read queue above my desk). Brendan doesn’t appear here, but auxiliary Fugazi drummer/roadie Jerry Busher does. James Canty and Busher currently make up French Toast, who I recall seeing at the IDF in Urbana when they opened up for Q & Not U, although I can’t say I remember anything about their music. 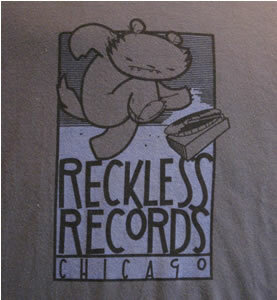 I also bought a Reckless Records t-shirt designed by Jay Ryan. Wearing a record store t-shirt is prime evidence that you are a record-shopping degenerate, and I believe in truth in advertising. Although I’d prefer news of a follow-up to their outstanding 2006 album Working Nine to Wolf, two members of Pinebender have solo projects coming to fruition, neither of which channel their musical day job’s penchant for slow, epic noise-rock. (Think Dinosaur Jr. 45s played at 33rpm.) Guitarist/vocalist Chris Hansen is moonlighting as Paletazo, with four songs up on his MySpace page and a show on November 10th at Schuba’s in Chicago. Paletazo confirms my suspicion about Pinebender’s songs: Chris Hansen’s songwriting is solid enough to stand up even without the threat of guitar bluster. (See the thoroughly quiet “Peterson Home” from their 2003 album The High Price of Living Too Long with a Single Dream for concrete evidence.) “Nothing Wrong with Love” in particular is worth a few spins. No word of any pending record release. Meanwhile, guitarist Stephen Howard steps into the frontman role for Quieting Syrup, best described as slowed-down bedroom-pop for the bedridden. Considering that he started out as Pinebender’s drummer and took over the role of baritone guitarist after Matt Clark left for Iowa, this change in roles isn’t surprising. His debut, Songs About a Sick Boy, will be released soon on Lovitt Records. It’s listed on Lovitt’s site, but I don’t think it’s available to preorder yet. As if his solo debut wasn’t enough to keep him busy, Howard is also now a member of Tight Phantomz, a 70s-hard-rock–informed group fronted by former Lustre King guitarist Mike Lust and supported by former Hurl, Taking Pictures, Milemarker, Thee Speaking Canaries (etc.) drummer Noah Leger. They haven’t released anything since a 2005 EP, but I’ll probably check out their next album if Howard’s on board. While I’m all for Hansen and Howard spreading their musical wings, I hope this trend doesn’t slow the already glacial Pinebender release schedule beyond the typical three-to-four year period.